December 2015 Aquarius Horoscope predicts that you will be the boss this month. However it will be prudent to enlist the support of others while trying to accomplish your targets. Planetary strength is located in the Northern part of your birth chart which makes career important. However things are going to change by 21st December 2015. Domestic and psychological issues will take over from then on. 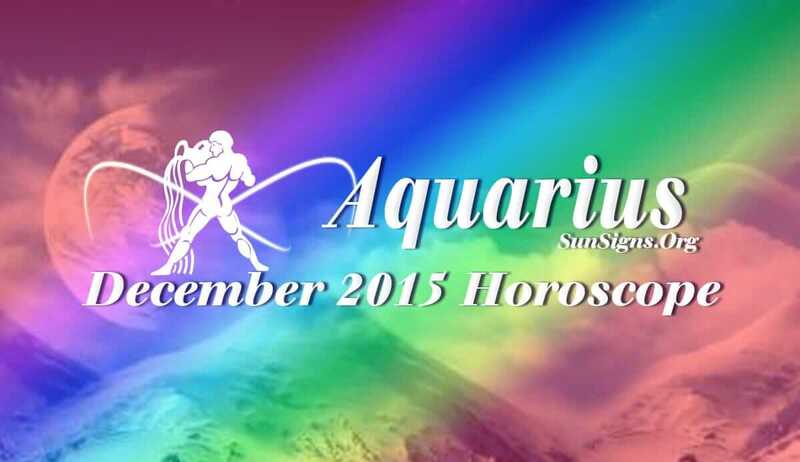 The Aquarius December 2015 monthly predictions forecast that you will have a harmonious environment at the work place. Your family and friends will be supportive of your career goals. Your business can get an excellent boost from your social circles. Superiors will encourage you to complete your targets in December 2015. In December 2015, income will come from overseas and from family for the Water Bearers. Businessmen have to promote their products to make money. Speculations will be non-productive. Follow your financial targets persistently and patiently to succeed. You should have clear strategies regarding finances, Aquarius. Love will chase singles this month. You will find your soul partner in social and spiritual environment. Your attitude towards love will keep changing during the month. Till the third week you look for friendly companionship and after that you search for the ideal relationship. Children and pregnancy will create some problems in relationships in December 2015. These conflicts can be eliminated by mutual discussions and understanding. Here are 5 relationship pitfalls that you need to prevent. The December 2015 Aquarius horoscope forecasts that health will be fabulous during the month. Regular walks and proper diet will enhance fitness. Remember the saying ‘Abs are made in the kitchen and not the gym’!